So today was a big day, my first half marathon back after injury, in fact I don’t recall running a half in 2013 so this will be my first since the Great North run in September 2012. This time last year I hadn’t even started my Couch 2 5 km and here I am about to run 13.1 miles. 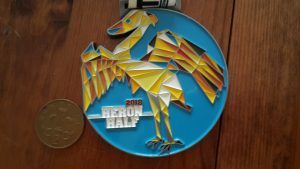 The half I had chosen was the Heron Half that is organised by Yeovil Town Road Runners Club and this was the first running of the event as they normally only do the marathon today. I was really nervous and had been all week but I tried to stay calm, the weather had played a factor in my nerves because at the beginning of the week it looked like sunshine with 20 degree temperature and humidity of 81%. But luckily the weather had changed for Sunday, yes it was warm but the sun didn’t come out and the humidity level had dropped. I was also nervous because 13.1 miles is a long way and from previous experience I know it can hurt especially the last few miles no matter how hard you have trained. The 10 am start for the half meant that there wasn’t a really early start to the day, being in Honiton we left at 8 am and we were parked by 8.45 am by which time I was desperate for the toilet. The parking was opposite the Fleet Air Arm Museum and it was free which is a big plus and there were plenty of porta loos so there was barely a wait. My best mate was running too, she had traveled up from Cornwall and today was her first half marathon so it was nice to be together and us both having a big day ahead of us. After our pit stop we wondered over to race HQ to collect our numbers, no Que here and it was still before 9 am and we were sorted. We spent the rest of the time looking up at the sky and hoping the cloud cover will stay, chatting and keeping our fluids up. My best mate asked me if I was nervous and I said YES and she said well you are hiding it well as you look chilled, it was weird as I felt nervous but I also felt calm. Looking back I felt more nervous for the Huff last month but I think it was a different feeling, maybe I was in the zone. It was soon time for one last pit stop, then time to check my laces, don my club vest, race belt and shades on and off to the start line. The gun sounded and we were off, 13.1 miles ahead of me, my longest run for many a year and time to relax, even though I was secretly hoping for a sub 2 hour time. I also wanted to enjoy it so I thought I would relax, find a pace I was happy with, which hopefully is not longer than 9.1 minute miles, drink every mile and gel around the 6/7 mile marker. Over the first mile or two I found myself running alongside a lady and we seemed to be at the same pace, I introduced myself and she told me that she was hungover and only had a few hours sleep. I told her I was very impressed and why was she here and she said she was doing it to get a club cap for doing certain races. I thought to myself I must keep up with her as I have had more sleep than her and she was going for a sub 2 hour time. I think at this point we were running 8.45 minute per mile pace which was faster than I had planned but I felt OK and thought I would hang on for as long as possible. It was nice to run along side someone, even though we didn’t chat much the odd word was spoken and it helped to tick away the miles. Around the 5 km mark we were joined by a couple of men and we ended up being in a little group and we all seemed to have fun and take it in turns to lead. The miles seemed to go pass quite quickly and helped by having a water station every 3 miles. I was still happy running at sub 9 minute mile pace and when I found I was going slower I made sure I picked up the pace, the slowing up was probably on the small inclines that we en counted or some of them it didn’t register that we weren’t on the flat. I was aware of my left piriformis muscle around 7 miles which I hadn’t felt in training but I did not panic, I just kept going, then around 9 miles my left quad became sore. If I recall if was around mile 9 that I seemed to leave my female running buddy behind and I found myself with one of the men running ahead of the group, he was after sub 2 and the pace felt good although it took a while to see the 10 mile marker. Even though my two last long runs were 11 miles, I was still expecting for the race to become tough at 3 miles but it didn’t, I felt good, despite my quad and I was keeping up the pace. My male buddy said I think I’m going to slow it down so good luck, I gave him a jelly baby and off I went. I was going to take a gel at this point but I decided to stick to jelly babies, this mile was a long undulating mile and you could see far ahead. I did not look at my overall time until I hit 11 miles and then I looked to see if I could make it under 2 hours and I could, it was 1 hour 38 minutes so even if I slowed to 9.5 minute miles I could make it. I think I tried to keep the pace at 9 minute pace and I over took some one too, we turned right and I remember this section as it was windey country lanes with no long vistas ahead which I was pleased about. With one last water station, a tractor following me, which helped me to push the pace, mile 12 was insight and another friendly marshal. I had made use of the last 2 water stations as I was thirsty and I didn’t want to run out of my drink before the end. A Yeovil runner called Anita was had over taken me and she was motivating everyone and saying stay with me for a sub 2 you an do it. We turned left and we were on the main road and you could see Yeovilton ahead and I still felt great. I was pushing the pace with no issues at all, was keeping up with Anita and mile 12 to 13 was covered in 8.16 minutes which was the fastest of the race. As soon as we passed the yellow sign for the car park I knew it wasn’t far to go, I didn’t need to check my watch as a man behind us kept updating us with the distance left to go, 0.5 miles, 0.4 miles!!! As soon as I could see the turning in to the arena I put on a sprint, especially when I had learned seconds earlier that we do not finish by running around the track. I over took Anita and I was actually sprinting and I felt good, I picked up my speed even more once I hit the track and over took a runner just inches from the finish. In the last couple of miles I felt amazing and I think the last time I felt that good on a half was my PB at Taunton 2012. I crossed the line and collapsed on the grass and I didn’t have to wait long to see my female running buddy come in and I gave her a big hug. I looked at my watch to see I was under the 2 hour mark, I thought maybe around 1.58 but no watch said 1.56.50 and my official time of 1.56.44 minutes and 105 out of 264 runners. I cheered my best mate in and she achieved the time she was looking for and shes now planning her next half. What I had achieve did not sink in till later on in the day, I was an still am very very very happy. We chilled out for the next couple of hours, I was in my race t shirt with my medal around my neck (which was heavy, but I didn’t want to take it off) the sun came out and we had some food whilst The Yeovilton Military Wives Choir sang. 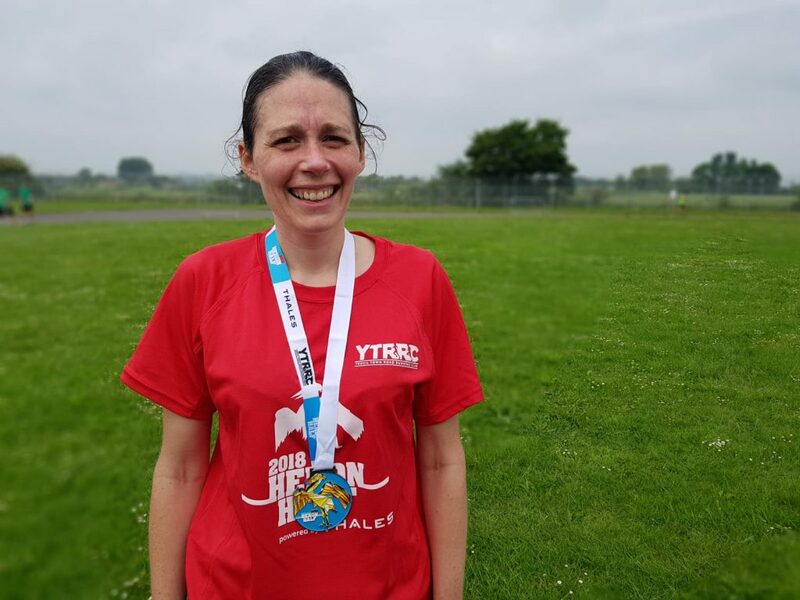 The circular route starts and finishes on the athletics track at RNAS Yeovilton and luckily you do not have to run around the track. The route is flat with only the odd tiny tiny incline and it is run on quiet country lanes which takes you through Somerset villages of Ilchester, Limington, Mudford and Chilton Cantelo. 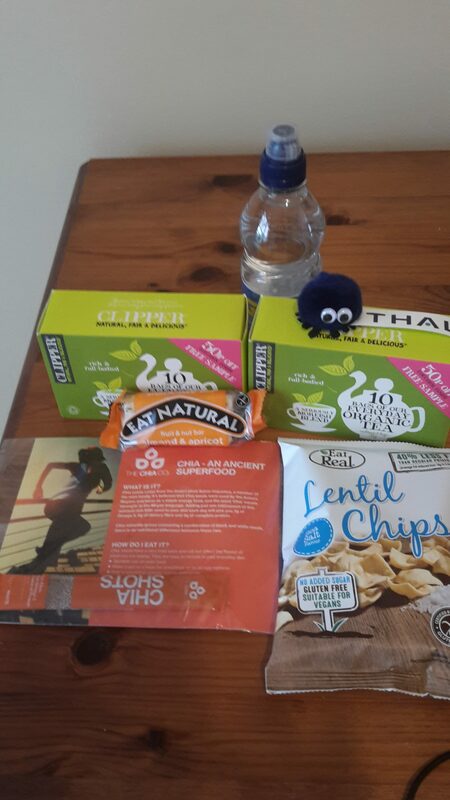 You get a very nice technical t shirt, a huge, heavy and pretty medal and a goody bag that includes a health bar, water and 2 boxes of Clipper tea bags. In the week leading up to the race you were sent a comprehensive email with the event site address, information on registration, what will be at the event site for spectators and details of what each water station will have on offer and how you can leave your own drink at a station. Great organisation on race day, signs for the car park, good number of porta loos, you collected your race number on the day and there was a separate tent for the half numbers and another tent for the full marathon. All the marshals were really friendly and enthusiastic and there were plenty of water stations with one every 3 miles. Social media was not used a great deal, I liked both the Heron Half and the Yeovil Marathon Facebook page. Admin did respond quickly with answers to questions posted on the pages and they did upload photos of what will be in the goody bag. The only thing they did not do it to post on their Facebook page the link to the results. Yes I would definitely recommend it to everyone because it is extremely well organised, free parking, fabulous route that is flat with 34 meters elevation gain which is run on country lanes and the marshals were fantastic. 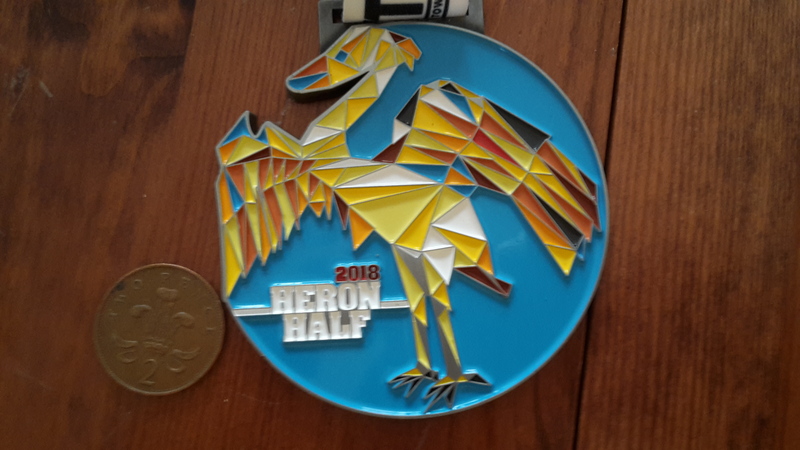 Great entry price as well, £22 EA affiliated or £24 if not and for that you get a stunning medal, technical t shirt and a goody bag filled with useful things. There is a choice of the marathon which is 2 laps or a children’s fun run which happens whilst the runners are out. The event site had plenty of food stalls, a bouncy castle and demonstrations by various groups in the middle.